By Sharon Roth Maguire, MS, RN, GNP-BC Chief Clinical Quality Officer, BrightStar Care Medications are a blessing and a curse. While we’re fortunate to have access to lifesaving, pain-relieving drugs, their abundance can lead to accidental drug interactions. It’s easy for a drug interaction to happen to you or a loved one. Every year, the Food and Drug Administration estimates that 1.3 million Americans are injured by medication errors. And the rate of medication errors at home doubled between 2000 and 2012. A few years ago, a member of my own family took too much aspirin-containing medication by accident. These were all over-the-counter medications for different ailments, but each contained aspirin (salicylate). She’s a young, smart woman, and it happened to her! Thankfully, she figured it out when she started to experience ringing in her ears — a classic symptom of aspirin overdose. She got to the doctor quickly, and they determined the cause. However, she did wind up with a small bleed in her intestine because of the excess aspirin. Below are tips we share with clients and caregivers to reduce the risk of a drug interaction. Use these strategies at home, at the pharmacy, and at the doctor’s office to help prevent complications such as hemorrhage, dizziness leading to falls, or even death from drug errors. What types of drugs cause medication interactions? Any type of drug can cause a medication interaction. This includes medications that the doctor prescribes as well as over-the-counter (OTC) drugs you can buy at the local pharmacy, such as pain relievers, allergy medications, cold medicines, heartburn drugs, and sleep aids. To the surprise of many of our clients, vitamins, herbs, and supplements also can contribute to medication interactions. Certain foods, such as grapefruit, can interact with certain medications. Be sure to check with your prescriber or pharmacist. It’s also common for antibiotics, blood thinners, and behavior drugs, used at times for people diagnosed with dementia, trigger interactions. When these are combined with other drugs, individuals are at increased risk for bleeding, falls, and other problems. Any time you notice a new or unusual symptom, particularly around the time a new medication is started, it’s a good idea to see your doctor. Many medications take a day or two to start causing interaction symptoms, and some (such as aspirin) may take a week or longer. When you go to the doctor, bring a list of all the medications you’re currently taking, including prescriptions, herbs and supplements, home remedies, ointments, eye drops, and OTC drugs. This might sound a little over the top, but it’s better to be safe than sorry. Any and all of these types of drugs can cause other medications not to work, or to work too well, which can leave your loved one at risk. Most drug interactions can be avoided with common sense and preparation. 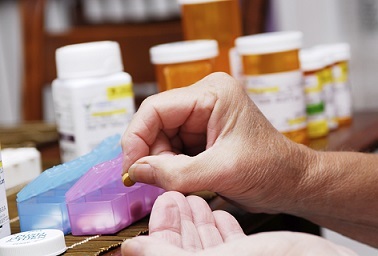 Ask questions about your prescriptions: When your loved one is prescribed a new medication, ask what it’s for. If it is meant to treat a symptom caused by another medication, keep asking questions. Often, instead of prescribing a new drug, there may be an alternative that doesn’t cause troublesome side effects. Avoid sharing medications: We urge clients never to do this. Everyone’s medical needs are totally different, even if your loved one is diagnosed with the same condition as a friend. The medication the friend was prescribed may be too high a dose for your loved one or may interact with other medications. Don’t take leftover medications and discard them safely: “Leftover” medication may be expired and not work as intended. It’s important to discard them properly. Pills flushed down the toilet can cause pollution issues, and medications tossed in the trash can be accessed by kids, pets, or individuals with drug addictions. Instead, ask the local government or pharmacy if they have a medication-disposal event, or suggest that they start one, particularly for devices such as needles and catheters that can’t be safely tossed in the trash. You may also consider crushing pills, dissolving them in water, and mixing this with cat litter before throwing it in the trash to reduce some of the risk. Don’t change dosages on your own: This includes taking too much OTC medication, changing the dosage yourself, or not properly taking the drugs a doctor has prescribed. If a drug isn’t working as expected, talk to the doctor before changing the dose or stopping the medication. Read the labels on OTC drugs: Many drug labels list warnings for potential drug interactions. If you have questions about a drug, head to the pharmacy counter in the supermarket and ask the pharmacist. You don’t have to be a patient to speak with them. If you are, they can access your electronic medical record (EMR) through their database for a more specific recommendation. Tell your doctor about at-home remedies. Clients and caregivers often share that they’re trying home remedies for their ailments, and we urge them to check in with their doctors. Like any therapy, at-home remedies can interact with medications. The doctor and the pharmacist won’t think the at-home treatment is silly. But they will help determine if it could affect your other medications or cause additional problems. Use one pharmacy and medical center whenever possible: EMRs that store all of your prescriptions can help reduce some of this risk, but not all hospitals and pharmacies use them. And EMRs don’t account for OTC medications or supplements unless you share the information with your doctor. During our first visit with a new client, a BrightStar Care Registered Nurse will review in detail all of the medications the client takes to check for potential drug interactions. And we check it again every 60 to 90 days, depending on the client’s level of care. This helps us monitor how medications affect the client every day. For example, if a person takes blood thinners, excessive bleeding or bruising may indicate that a condition has changed or something else is wrong. Our caregivers are aware of these potential issues and trained to alert the nurse if there is a concern. We’ll also help you understand the doctor’s orders about a certain drug and what each drug does if you have questions. Related reading: Improving Patient Safety at Home As a family caregiver, you are your loved one’s best advocate. 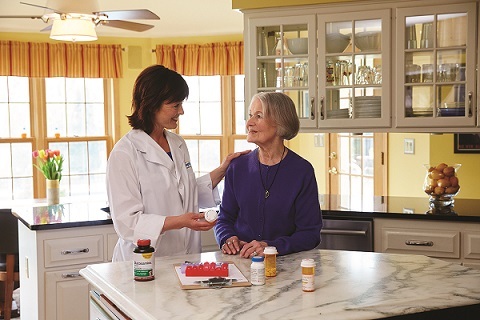 If you are concerned about the number of drugs your loved one is on, whether they’re taking them properly, or about possible interactions with OTC drugs or supplements, let your home health nurse know. You, your loved one, the doctor, the pharmacist, and your home health nurse are on the same team. We all can work together to make sure medications are taken safely and effectively.